The wind screams through 1 World Trade. 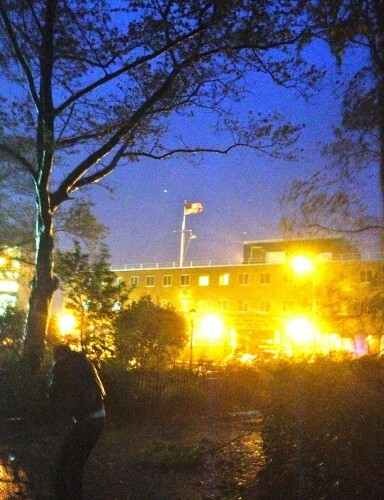 Photo by Alexandra Glorioso for South Brooklyn Post. 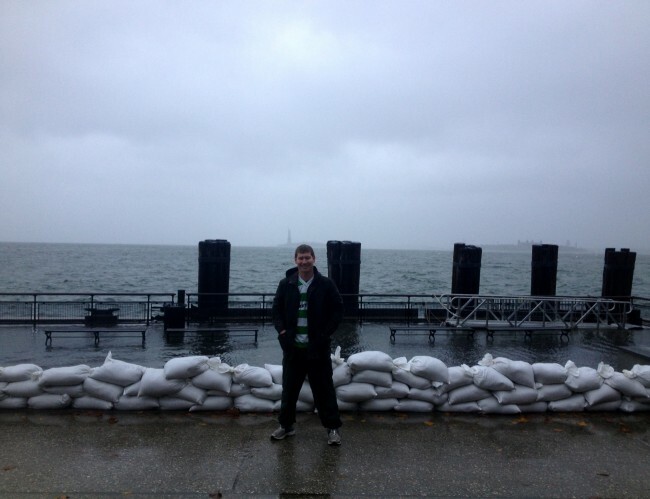 Some fool in the Hudson River at 5 p.m. Photo by Alexandra Glorioso for South Brooklyn Post. 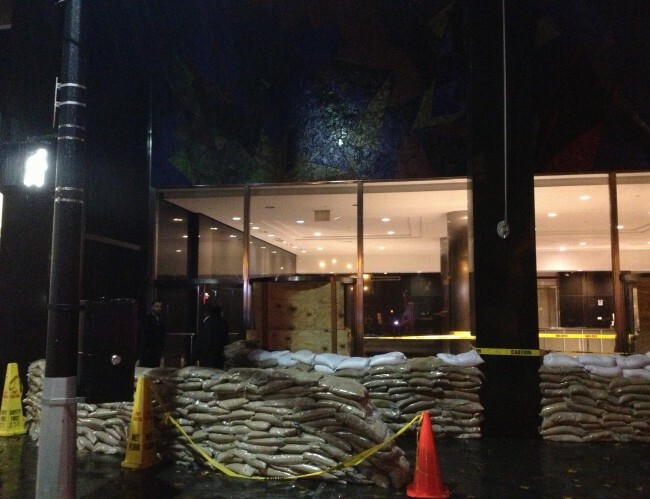 Hurricane Sandy is beginning its onslaught of Manhattan. 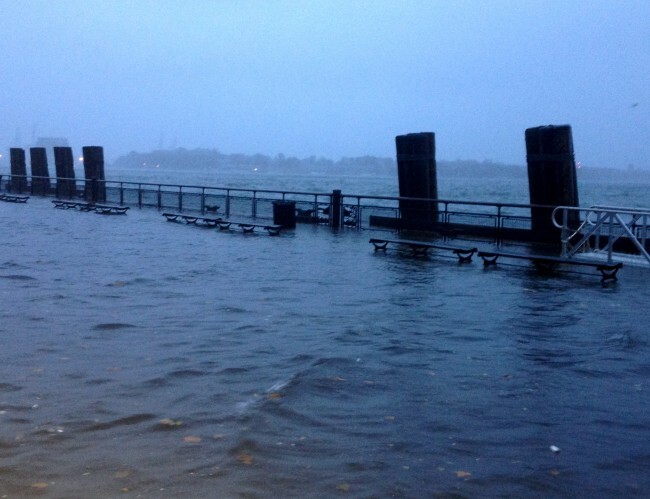 Battery Park’s benches are barely visible as the storm surge combines with the tide to flood the seawall. As the storm picks up velocity, the meteorologists have changed it from a hurricane to calling it, dramatically, a “superstorm.” See the New York Times’ live updates for full storm affects. Financial worker Mark Giordano at 5:30 p.m. Photo by Alexandra Glorioso. He said that at 8 a.m. Monday morning, there were 40 percent of the normal amount of cabs on the road. 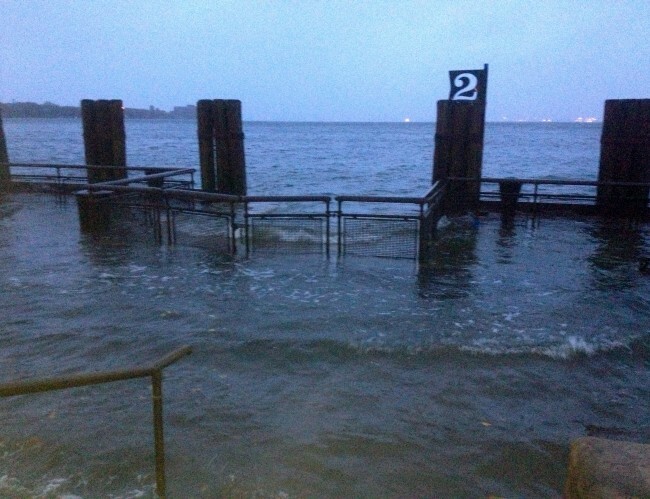 By 4:30 p.m., he said there was something like five percent of the usual, and he predicted there would be few cabs after 7 p.m.
By 5:10 p.m. in Battery Park, the water spilled over the lower seawall with each wave. 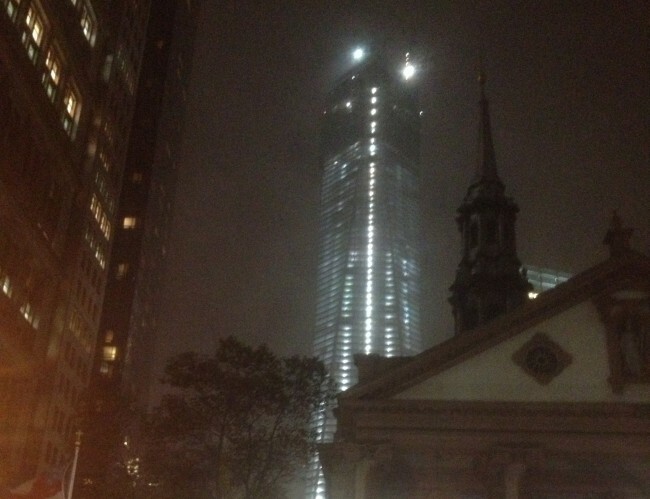 The wind howled through the new World Trade Center’s open windows. 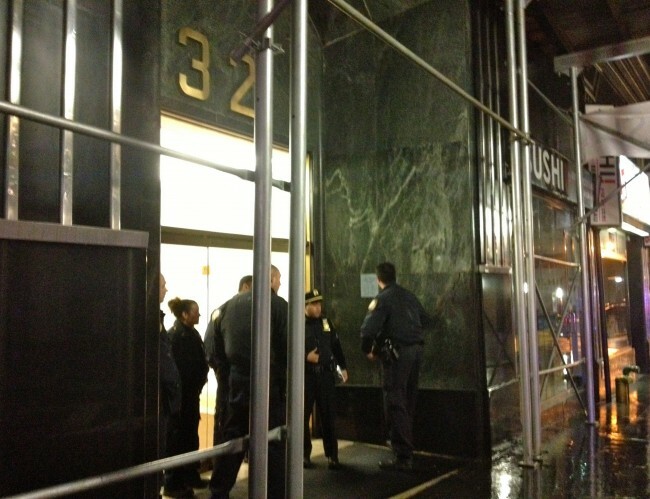 Police Discuss their next steps at 32 Broadway. Photo by Alexandra Glorioso for South Brooklyn Post. Giordano said he took precautions, stocking up on water, food, and Oreos. 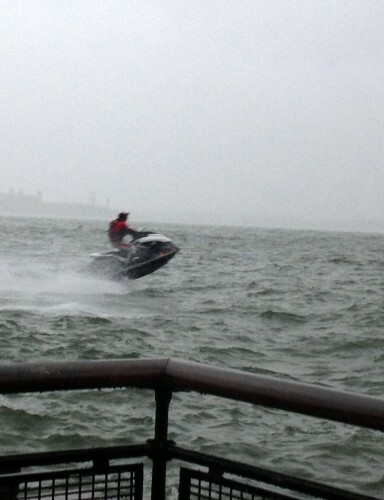 He said he would go near the water for 30 minutes max. He said he didn’t believe the storm was related to global warming. Meg Gottemoeller and her daughter Philippa, 26, live on Wall Street. Meg is from Ohio originally and Philippa was born in New York City. Meg said the only comparable storm she had seen to this was a snow storm in 1984. 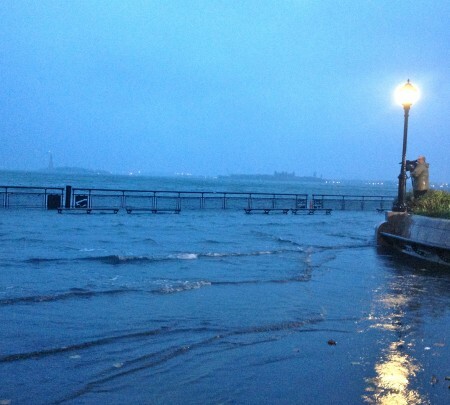 She and her daughter had come down to Battery Park because they were skeptical of the media hype, but after seeing the water rise over the seawall, they decided it was time to go home. Meg works for an economic research organization and Philippa is a freelance stylist. Both are convinced the storm is due to global warming. The water reached the first step by 6 p.m. 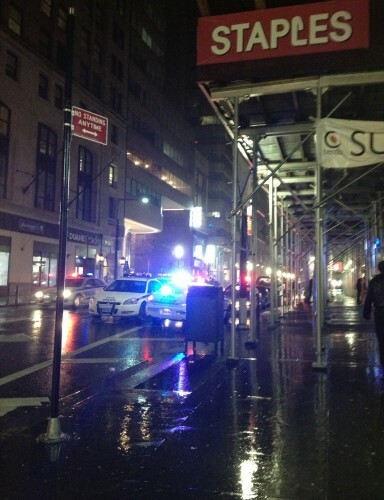 Journalists were told to evacuate the area by 6:30 p.m.